This week Free Download Friday focuses on accessing MILLIONS of FREE DIGITAL BOOKS on Google via Google Books. I was an early adopter of Google Books when it first was available and the collection has really advanced my genealogy and family history research. Here’s a tip: When I am on a research trip at a library or archive and I see a book that I want to use for research, I pull out my iPhone and search for the title in Google Books. If it is available with Full View (see below), then I know I can spend the valuable time at the library on one-of-a-kind or hard to access materials! I’ve prepared an easy-to-use cheat sheet for Google Books for Genealogy which I often use in my mini-lecture on the subject (it is a quick 20 minute presentation). Please check it out and let me know your thoughts! Click HERE to get this cheat sheet in a printable PDF file and make sure you share it with your fellow genealogists and family historians! 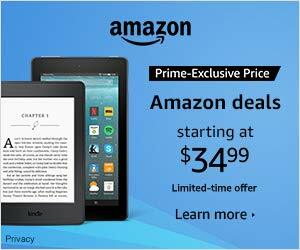 HUGE SALE on Amazon Kindle and Amazon Fire Devices – as low as $34.99 USD! Deals, sales, and special offers on Echo & Alexa devices, Fire tablets, Fire TV, Kindles, Amazon Security Cameras, Dash Buttons, and more.